Did Cape Town Learn From 'Day Zero'? Cape Town, South Africa, averted the "Day Zero" water crisis that made headlines earlier this year, but is the close call enough to change the city's water consumption habits? Cape Town, South Africa, averted the "Day Zero" water crisis that made headlines earlier this year, but is the close call enough to change the city's water consumption habits? 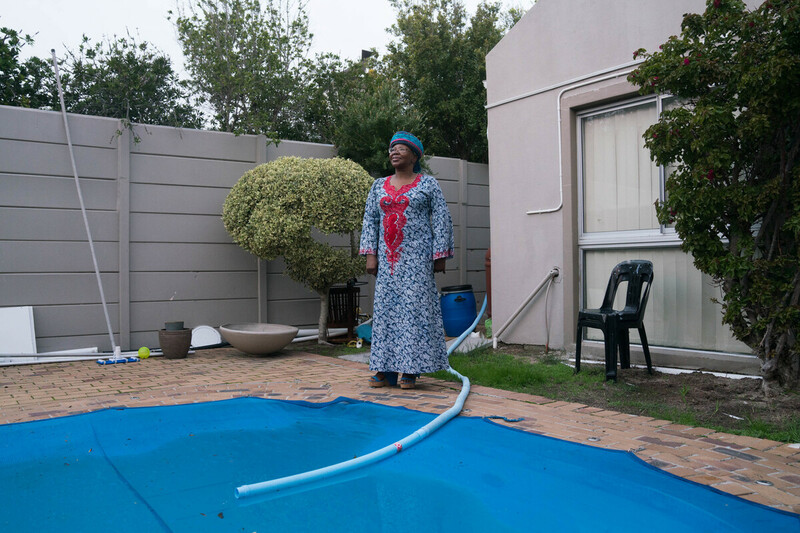 Sindiswa Lingela stands in the backyard of her home in Cape Town with the swimming pool that she fills with collected rainwater. The drought encouraged her to get completely off the municipal grid. When I got off the plane in Cape Town, South Africa, back in June, billboards and announcements were everywhere - extreme drought; save water like a local. UNIDENTIFIED PERSON: We are working around the clock and saving water in every way we can. SHAPIRO: Cape Town was in crisis, on the path to becoming the first big city in the modern era to run out of water. And to my surprise, the city was about to make a major announcement. At City Hall, I crowded around a big wooden conference room table with camera crews and newspaper reporters to hear Cape Town's Deputy Mayor Ian Neilson say this. IAN NEILSON: We're now in a position to state that we have not only managed to avoid Day Zero this year, but we can also safely get through the summer of 2019. SHAPIRO: Day Zero was the city's term for the day the taps would run dry and people would have to line up to get water rations. This victory announcement came with one very big caveat. NEILSON: We have to ensure that we make a permanent change to our approach to water usage. SHAPIRO: People in Cape Town had cut their water consumption by more than 50 percent. Even fancy hotels put buckets in the shower to collect water for reuse. I heard the phrase if it's yellow, let it mellow at least once a day. After that announcement, the question became, what happens after the threat of catastrophe is lifted? As the city's communications director, Priya Reddy, explained, the end of a crisis is not the end of the challenge. PRIYA REDDY: It's like being on a diet forever. Nobody does a diet forever. At some point, you're just going to gorge yourself on pretty much every carb you can find. REDDY: So it's like that. SHAPIRO: So how do you balance that from a communication standpoint? Because on the one hand, there is no more Day Zero; on the other hand, only if people continue to conserve water. REDDY: It's a nightmare, I tell you. But, you know, the images of people queuing for water and buying bottled water - how close we came to what would have practically been Armageddon - not quite but, I mean, near enough. We're hoping that those images and that recent reality will stay in people's minds. SHAPIRO: I went to find out whether or not the water crisis is staying in people's minds and whether they'll do anything differently now that the immediate threat has lifted. Adrian Flack lives in a big house out in the suburbs with his wife and kids. You're hearing him fill up a 1,300-gallon storage tank with rainwater he's collected. To him, this sound means security for his family and self-sufficiency. ADRIAN FLACK: My water tank is right next to my bedroom window. And I could lie in bed in the early hours of the morning and hear water flowing into the tank. A peaceful feeling comes over you because you can sort of calculate for yourself, oh, that's how many extra days that we're doing OK. We've got some extra water. SHAPIRO: Flack runs his own company installing these tanks and doing other handyman work. He put them in his own house to make sure his family would have enough water even if the taps run dry. FLACK: I installed that specifically so that if Day Zero did arrive, I wouldn't have to go and stand in a queue to collect water. I calculated we could quite comfortably survive through a summer with that amount of water. SHAPIRO: Flack installed about a hundred of these water storage tanks across the city in the last year. But right now his yard is full of extra inventory, dozens of enormous empty tanks. Since the rains arrived, demand for these things has tanked. One of the questions we're trying to answer is, can people's long-term habits change without the pressure of something like Day Zero? FLACK: I think what you're going to see now is that now that they've announced Day Zero is basically shifted out, water consumption will start climbing again. It's just human nature. People are going to relax. SHAPIRO: But a lot of the people we met in Cape Town told us they have no plans to go back to their old water habits. Sindiswa Lingela travels a lot for her job in education. And when she's in a place where there's no drought, she still doesn't allow herself to fill up the bathtub for a long soak. SINDISWA LINGELA: Next week I'm going to be in Durban, and I know I'm going to take quick showers. I no longer know how to relax and just enjoy a hot bath. SHAPIRO: Is that a good thing or a bad thing? LINGELA: I've got bottles and bottles - I'm going to show you bottles of bubble bath that I no longer use. I just admire them to say, you know what? We used to be friends here in the bath. SHAPIRO: Lingela lives in a comfortable house with a swimming pool that she fills with collected rainwater. The drought encouraged her to get completely off the municipal grid. She proudly posts her monthly water bills in a neighborhood chat group - about 50 cents a month. And the peer pressure here is real. The city of Cape Town created a map online with green dots showing which houses were doing a good job saving water. Two of the houses in Lingela's neighborhood didn't have the dot. And did you know who lived in those houses? SHAPIRO: And so what happened then? LINGELA: So we just commented to say, oh, you know, we'd like all our houses to be green. And so you just comment generally. SHAPIRO: And then did they get the green dot? LINGELA: They got the idea. The nudge worked. And, yeah, all our houses have got a green dot in this street. SHAPIRO: Lingela grew up poor, witnessing drought firsthand. And she says that shaped her. SHAPIRO: From not having enough water, from drought. LINGELA: From drought - from drought, the lack of water, no grass, nothing to feed on. And when you see a dead carcass of a cow or a horse, it stays in your mind. SHAPIRO: One-fifth of Cape Town's population lives in crowded, poor neighborhoods called townships. Khayelitsha is the biggest one in Cape Town, a place where water problems existed long before this drought. These are small tin shacks made of brightly painted metal and doors kind of hanging off the hinges. Some of them have outhouses in the front. There's no flush toilets, no running water in these houses. So the idea of water restrictions is almost laughable because people live with water restrictions every day. SHAPIRO: This is the tap that some 25 households have to share. It's basically a cement column coming out of the ground with two faucets attached. And when people need to get water to cook or wash, they bring a bucket here, fill it up and carry it back home. LIHLE SHENXANE: In our household, we are six. So that's how come we come five times a day. SHAPIRO: Lihle Shenxane is 24, filling up a bright yellow bucket from the tap. SHENXANE: And it's a bit difficult for us to come and collect water. And sometimes at night - and, you know, Khayelitsha's one of the most dangerous places. And there's crime. So if the bucket is empty, like, at 10 o'clock - so it's difficult to come and collect water. SHAPIRO: How does it make you feel when you hear the city talking about people who need to save water when you already have so many challenges to get water? SHENXANE: I feel like it's an insult for blacks in Khayelitsha because we already have difficulties, like, when we have to collect water. But when it is in their interest, they tell us that we have to save water. SHAPIRO: Even though 20 percent of the city's population lives in these conditions, they only use 4 percent of Cape Town's water. MUSA GWEBANI: When climate change does happen, it will affect poor people the most. SHAPIRO: Musa Gwebani advocates for people living in townships through her group the Social Justice Coalition. GWEBANI: I suppose governments need to always look like they're doing something good. And so they like having grand announcements like there's not going to be a Day Zero. But actually, it isn't a victory because there's climate change, and this is going to happen again. And we haven't made a plan for it not to happen again. SHAPIRO: It's been two months since I was in Cape Town. Since then, the rains have been steady, and the dams are filling up. And remarkably, since Cape Town announced that there will be no Day Zero, people's water usage has stayed as low as it was when the drought was at its most severe. SHAPIRO: And our series this week on drinking water around the world was produced by Kat Lonsdorf.